Dice Drinking Games - Get on a Roll Now! Dice Drinking Games - Get Them Rolling! Get some dice, grab plenty of beers or even a keg and let's celebrate the night away. Wait - "what's the dice for?" - you ask. A night full of alcohol and we need a die? Are you already drunk? These may be some of the questions you have in your head after hearing the word dice. But, don't you fret as I am still not drunk and the dice; well we will be using it to play dice drinking games. This will be a new experience for the group that is more used to the traditional things people do when they get together with friends. Drinking has been usually associated with ranting about everything you hate about life. Tonight let's try some new flavor to this traditional friends' get-together, so that we can still unwind without being too negative about life. The first game we can try requires each member of the group to have their own die. In this, the whole group simultaneously rolls their dice while one assigned member will pick a number from 1-6. Whoever holds the number that was called will get a chance to drink. Another twist to this game is that the assigned member can call on odd or even numbers, which would allow more members to drink. To take the game a notch higher, a number can be also called aside from even or odd numbers so that whoever holds that number will be required to drink double the amount agreed upon. It is one of the more popular dice drinking games around. A dice cup and five dice is all you need to get this game started. It can be played by at least two people, but the more is merrier in this game as the rounds are dependent on how many members there are in the group. For example, six members will have five rounds and however was left with no wins in all the rounds will suffer the consequence or buy all the winners beer! Scoring in for Bar Dice is value based as three 5s beats three 4s and it is also turn based as a player who gets three 5s in two rolls beats someone who gets the same value in three rolls. This dice game is simpler game compared to those above, as it only requires the players to be more sociable. College students usually play this game. It needs three people to be the Three Man, who may be chosen or volunteered, to be responsible to do all the drinking. 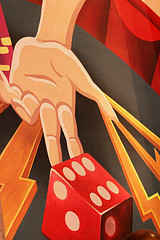 Members of the three man can pass their role to another member if he ever gets three or a sum of three in his three chances of rolling the die. The game also have rules that depends on the dice and examples of which are when someone gets a three, the Three Man will have to drink and if someone gets a sum of nine in their chance to roll the dice, everyone in the group gets to drink. So stop questioning if you want to get drunk! Grab a dice and let's get the drinking started with these fun and stress-releasing dice drinking games!